How awesome is this? Seriously? I WANT! I started decorating the house for Halloween yesterday (and started a trend apparently as now a few of the neighbours have done so too). Just simple things - 'blood-smeared' hand prints on the window with "Keep Out" written in 'blood' above them, spooky spider webbing and nasty spiders on the front window, mirror and light in the sitting-room, pumpkin garlands - that sort of thing. 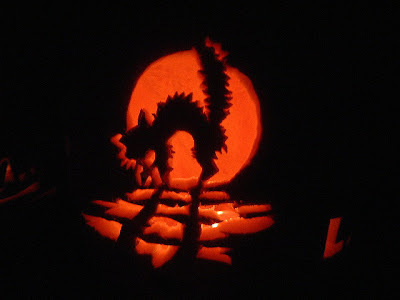 I also want to have a carved pumpkin at the front door this year so I've been researching different designs and styles. I've only ever carved one pumpkin before and I want to step up my game this year. This is amazing detailed and oh-so spooky. Love it. The first thing I've learned about pumpkin carving is you need to get the pumpkin to sit level so trimming off the bottom is really helpful. It also means you can sit the pumpkin over the light source rather than trying to precision drop the candle/light into it. This is really helpful for pumpkins that you want to sit on a step or window-ledge, less chance of them wobbling or falling! Serrated knives are the best option for cutting large holes in pumpkins, and a little paring knife for detail work and tidying up edges. You can also use other tools like lino cutters to pare away layers rather than cut right through to create some cool effects (this is what I'm planning on doing as the design I have in mind would otherwise have a big blank cut-out space and wouldn't have the same effect at all). Really want to do a cat pumpkin this year so this might be a contender. Scooping out the inside of your pumpkin is best done with a big metal spoon, or ice-cream scoop. Don't forget that you can spice and toast your pumpkin seeds for a yummy post-carving snack! This guy is pretty scary right? Think he'd terrify the neighbour kids! 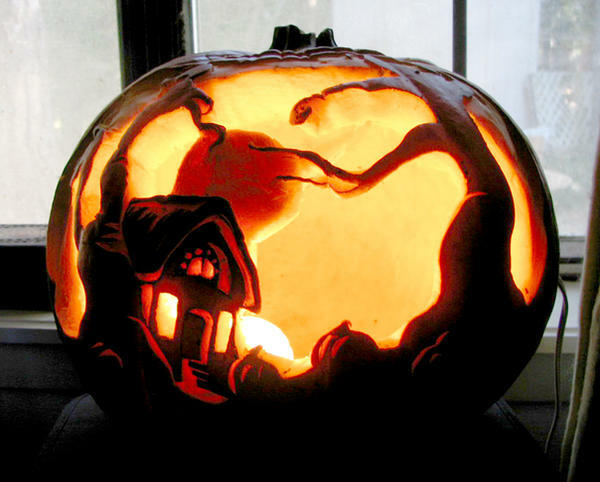 To stop your pumpkin molding and rotting smear petroleum jelly (like Vaseline) onto the insides and cut edges. This helps keep it fresh for longer - though at best you'll still only get about a week out of it so leave the cutting until a few days before Halloween. 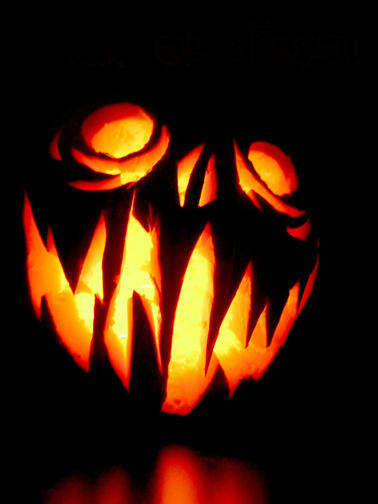 I'm planning on using either a battery-operated LED or glow sticks to light our pumpkin this year. Candles are the traditional light source but small kids calling to door + open flame = not ideal. Plus the wind can't blow a glow stick out! If you are using candles remember to be fire safe, only use them inside a fresh pumpkin (not a dried one or a man-made one) and cut a small hole in the top of the pumpkin to act as a chimney and allow heat to escape. You can see some of the pumpkin carvings I came across above, and I've added more below. 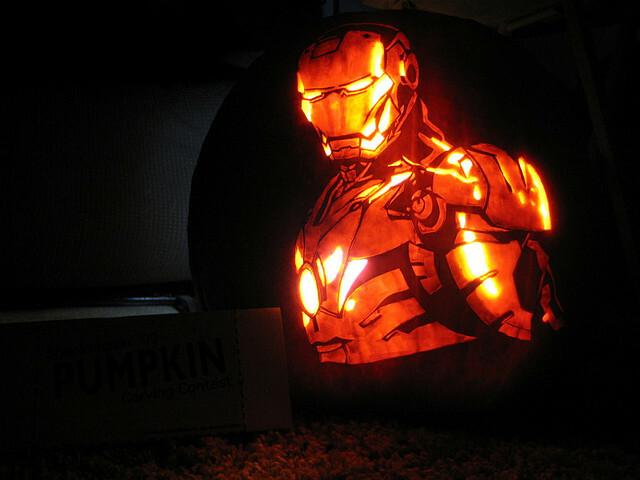 Pinterest has some really great pumpkin carving links too that you should check out if you're not sure what you'd like to do with your pumpkin. This website has a fantastic selection of basic pumpkin templates, and a section on more advanced designs if you're feeling crafty! I'm loving the owl and the mouthful of BOO from the beginner section and isn't the headless horseman from the advanced section amazing!?! Think I'm going to stick with this one though. It's simple, it's a kitty, and if I don't cut the greyscale section completely away but instead pare it down it should look pretty darn cool by the time it's finished! 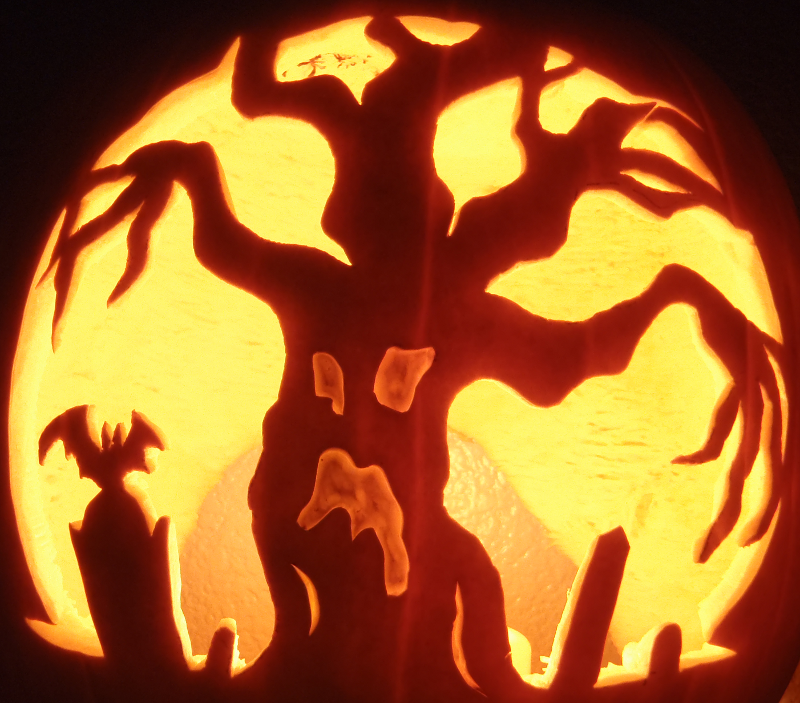 What are you going to carve your pumpkin as this year? Anyone out there brave enough to try and replicate that incredible Ironman pumpkin?